Admittedly, the first time I saw the first instalment, I was not really a fan. I found it way too cheesy and that the singing was very OTT at times. However, once I'd seen it a few more times, it grew on me and it became a bit of a guilty pleasure. I started to take it for what it was, a form of escapism that doesn't take itself too seriously. 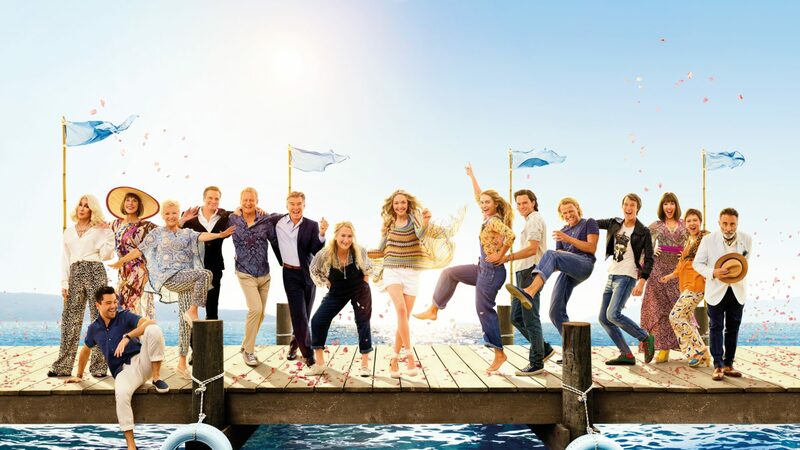 10 years on from the original, Mamma Mia was back with a sequel. The second instalment focused on young Donna's life and how she got to live on the island of Kalokairi in Greece. It also switches back to present day, showing Sophie in charge of the recently refurbished hotel and dealing with Sky living in New York. The first half of this film, I'm going to admit I was not a fan of. Lily James is amazing as young Donna, but the whole time I just sat there cringing at the overacting, cringey lines and very very OTT musical numbers. In particular, I thought that young Harry (played by Hugh Skinner) was a little bit too much. For the first half I breathed a sigh of relief when it switched back to present day. Focusing on many of the lesser known songs, the cast overall were very entertaining, although I felt like they all seemed a lot more confident singing ABBA's more notorious songs. As the film progresses it picks up the pace and in my opinion, became far more entertaining - with more heart and authenticity. Of course when Cher arrives, it is an outrageous scene which showcases what she is all about; an entertainer who doesn't really care about what anyone thinks of her (which is what we all love about her). The cast list is undeniably incredible for this film, with the original line-up and some new faces in the form of Jeremy Irvine (young Sam), Lily James (young Donna) Andy Garcia (Fernando Cienfuegos) and Josh Dylan (young Bill) to name a few. I think the new cast are good and add an extra element of entertainment to the plot but I feel that some of the scenes could have been cut down or made less OTT (yeah I'm thinking about the bit in the restaurant when Donna and Harry sing Waterloo). I left the cinema feeling disappointed and that the film had lost the heart that it had in the original. I hate to say it as I know many people who loved it, but I personally wouldn't recommend this. I found it quite disjointed and I wouldn't rush back to see it.